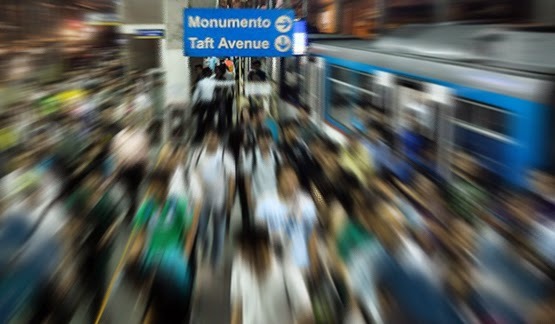 If you are a commuter in Metro Manila, you know all too well the hassles of getting around by public transport especially during rush hour. There are the long treks to the bus stops that are constantly being relocated, the endless queues of commuters waiting for a ride along heavily polluted thoroughfares, the crushing crowds in buses or train cars, the pickpockets and the molesters all add up to make your daily commute a living hell. Like a Godsend, something comes along to make things considerably better. Years ago some people had the brilliant idea of offering a shuttle service. Seeing the opportunity to provide a better commute, a group of van owners got together with commuters to organize the service. They asked commuters where they usually needed to go, how much they would usually pay and what time they needed to get there. And the shuttle service was born. Basically they offered a comfortable ride when you needed it most at a very reasonable price. So naturally these shuttles thrived. This service was precious. The drivers were polite and very responsive to the commuters' needs. When more people needed a ride at a certain time, they would find new van owners to fill in the schedules. Many of the drivers were office employees themselves, who were also on their way to work and they would take along a van-load of commuters with them for a single trip. There was a dispatcher to coordinate with drivers and commuters to make sure, drivers would be available or if not to inform the commuters that there are no more vans available. It was community spirit at it's finest. Commuters did not really fear for their safety because they mostly knew all drivers and the dispatcher by name. The drivers even gave out their cell numbers so it was easy to coordinate schedules with them, if needed. Then after a few months of this relatively blissful commute, government comes in and starts swooping down on these vans because they were 'colorum'. It might be reasonable to presume that this is a government code name for milking cow, because from that time on, all the driver would talk about is the 'lagay' or bribes they constantly had to pay the MMDA or LTFRB officers when they were flagged down. So naturally they had to increase their rates to cover for this added expense. On a bad day, you would be riding in one of these vans when it happens, and you would have to suffer a considerable delay, because of the haggling process. On a really bad day, you would have to get off and find a different ride because the officer would impound the vehicle, forcing you to pay additional fare. And your commute hell begins all over again. You would think that from all the money the government earns from these fees and fines they collect, that they would improve the traffic and public transport system, but really it has only gotten worse over time. And you would think that because there is such a dire need for more and better transport, that they would find a way to expedite the processing of the permits of these vehicles, which these van drivers desperately sought to avoid being bled by unscrupulous officers, but it took months and months before they were finally granted permits. 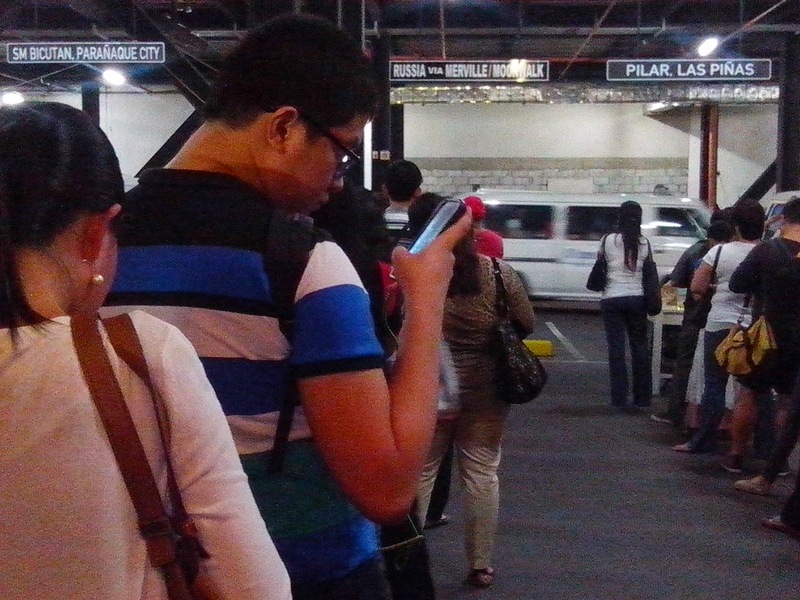 In the meantime, the drivers and the commuting public suffered. The Shuttle service drama did end at some point when all the vans where issued permits, however talk persisted about how some people made money because only a few people were granted franchises and everyone else had to go through these few 'lucky franchise owners'. If you do a web search you will find vehicles with such a franchise being sold openly on the internet. It makes you wonder what exactly is being regulated here. Just recently, the same thing is happening to another one of those commuter gems, Uber. I found out about Uber from friends who were raving about the service. Naturally I was skeptical at first, a private car available at your beck and call, seemed iffy. But I tried them once, and WOW!. It was everything they said it was. The driver was polite, the car was awesome, the ride was more than pleasant and the fare was better than a cab's. A side note, I say the fare is better because there was no moaning from the driver how far he has to go to take me or how he can't get a fare coming back and that I have to add like 50 up to 300 bucks extra before the driver agrees to take me. The fare you actually pay will depend on how desperate you are to get a cab. This is just to mention one of the many annoying things you have to put up with, just to get a cab to take you, if the driver finally decides to take you. We all know the drill. Uber does not charge any add on fees for the pick up service unlike the Grab Taxi service which adds PhP 70 to your metered fare. My Uber driver, Bonifacio (with a 4+ rating displayed in the Uber app along with his name, picture , car make and license plate nmber), simply loaded my luggage in his trunk and drove me all the way home, with a friendly chat along the way. He explained to me in detail how Uber works. He also explained why he took longer to arrive at the pick up point. When at last we arrived at my house, he informed me how much my fare was, conveniently charged it to my credit card. Easy Peasy. He even refused a tip. 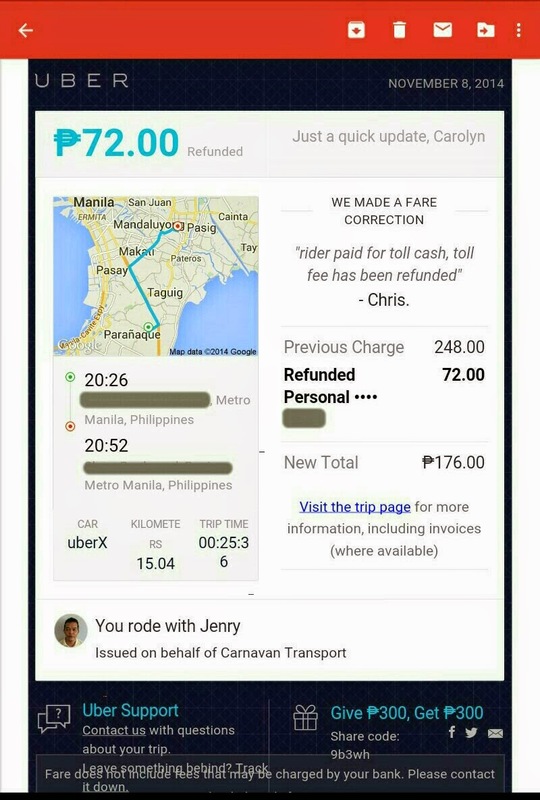 On one of my trips with Uber, we instructed the driver to take the SLEX and then handed him the toll fee. Later I found out through a confirmation email, that we had been billed PhP 72.00 for Skyway toll. I promptly emailed Uber informing them of the error and requested them to reverse the charge. In Uber's email reply, I was informed that all transactions should be cashless, meaning the driver should take care of all the cash transactions and charge fare plus any additional fees to the passenger's credit card at the end of the trip. They then informed me that they have reversed the charges, with apologies for the mistake. They also said that they will inform the concerned driver to prevent this from happening again. I checked my credit card records and indeed they had reversed the charges. Then I hear that the government was at it again. They were coming after Uber as 'colorum'. When I heard it, I blew my top, especially when I read that the reason they claimed they need to do this is to 'protect the people'. WHAT???? Why does the public need to be protected from excellent private service? The only reason I can think of is because it is another golden opportunity for them to bleed the car owners dry, especially now that they have begun implementing the *Joint Administrative Order No. 2014-01 (JAO 2014-01), increasing the fines and penalties for traffic 'violations', Kerching! Kerching!. The officers on the street will have a heyday, every time they hit the Uber jackpot. At PhP120,000.00 a pop. There will be plenty of room for them to haggle a bribe. 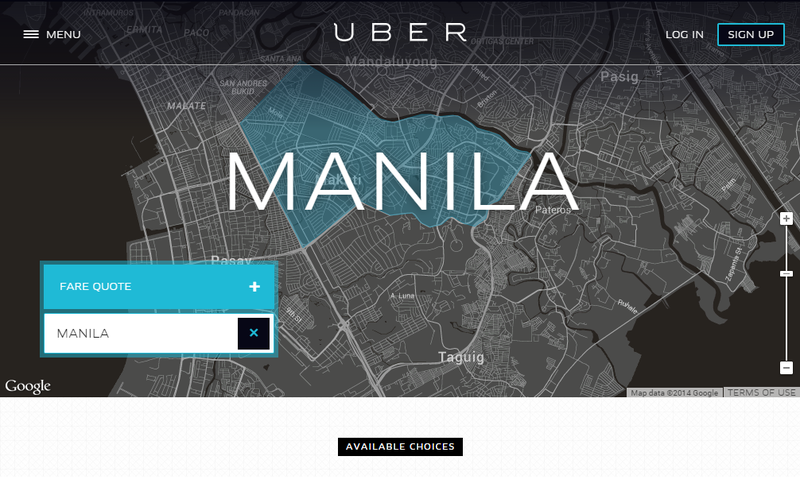 A news report mentioned that Uber was fined PhP 200,000.00 per car. Go figure. Based on many online discussions and news feeds on the issue of Uber, government is again taking the stand that there is an urgent need for 'regulations' to 'protect the public'. The public response to this position is outrage at the government's unwelcome intervention. The primary reason being that rarely, if ever, has government intervention ever translated to any substantial benefits to the public. The more likely effect of regulations are inconvenience, harassment, oppression and more opportunities for corruption. Any public benefit rarely ever materializes as a consequence therof. In the case of the Shuttle Service, for instance, a lot of effort and resources were allocated to stop the 'colorum' vans from offering the service, but since the public transport system could not fill-in the slack, it was the commuting public that suffered from that campaign. Even now that the vans have acquired the permits, very little has changed in terms of the safety of these shuttles. And since these franchises are openly peddled on the internet, there is still very little control over who operates these vans anyhow. It begs the question, who really benefits from these regulations? Certainly not the public. From the onset, the private shuttle system had organic mechanisms in place to protect the commuters' safety. The commuters knew the operators personally, and the commuters knew each other. There were designated people to whom you could complain or raise concerns to and these concerns were promptly addressed, If you, accidentally leave something in the van, you could always contact the driver to advise him about it. It wasn't perfect but the system worked quite well, sometimes even better without government regulation. Uber is proving to be the same. There are feedback and rating systems that collect reviews from the users themselves, which commuters are very inclined to trust more so than they would any government issued certification. Impeccable service delivered time and again, plus personal recommendation from friends trumps any guarantee that a government permit can offer. The fact is, despite all the regulations already in place, the public still regularly fall prey to abusive drivers, substandard vehicles, unethical practices, reckless driving and criminal activity within the bounds of the 'regulated transport', And the government with all its regulatory bravado, has managed to regulate merely the fees and paperwork of transport with very little positive impact on on public safety and welfare. Unlike trusted private organizations, many regulating agencies, along with many unscrupulous transport operators are persistently in breach of public trust. Their track record in 'serving public interest' is so dismal that any of its attempts to intervene on behalf of the public is viewed with utter disdain and suspicion. If the government is really serious about protecting public interests, it should begin with that end in mind. It should constantly assess the actual impact of its policies and actions on the public; if indeed they are actually contributing to public welfare or simply adding a needless burden. They should regularly monitor if special favor is somehow given, whether intentionally or unintentionally, to undeserving entities that thrive only when awarded monopolistic advantages. Often times, policies are created and implemented without any real grasp of the actual situation. Public policies created by people who are so removed and shielded from any real life knowledge or experience in the field, are severely flawed by poor perspective. The resulting policies would then tend to aggravate the issues more than they can alleviate them. They end up protecting a few favored sectors who deliver substandard services while the frazzled public is hung out to dry. The public is outraged by the knee-jerk reaction to the Uber issue. And why not? Government cannot seem to recognize what is the common good, Unlike these service providers, who have worked hard to earn their customer's trust, the government has done nothing to repair the badly fractured trust of the public. Before the government starts messing with the few transport services that are working well in this country, they should first fix the rotten public transport system as well as their own broken agencies. They are pushing the people into a corner with no other option but to fight back. Government should stop penalizing the service providers in society who actually fill an unmet need and instead find ways to help them deliver the much craved for services. If the government wants to regain public trust, it should start providing meaningful service or at least facilitate the delivery of such services. Every Filipino must have realized this by now. Before a he even gets his pay, anywhere from 5% to 32% of his taxable income (if he earns over PhP10,000/ month) will be withheld at source for taxes. Someone who earns PhP 25,000.00 a month, will have to work up to nearly **2 months per year just to pay his taxes. 12% of most of your purchases will go to EVAT (Expanded Value Added Tax). And if you save in a bank, 20% of your minuscule interest will be withheld for taxes. Running a small or medium sized business is not any easier, unless you have access to 'special privileges'. For the small business owners, who cannot afford 'expert facilitation' (a.k.a, fixers) they will be made to run around repeatedly trying to comply with vague and conflicting instruction that change with every elected incumbent. They will be asked to process and pay for redundant and sometimes unnecessary paperwork. And they will most likely be bullied into paying more fees and taxes than they really need to after being threatened with even more fees, paperwork and an indefinite extension of business processing period. So far, by the government's own reports, a great deal of our taxes have either been plundered or spent on unauthorized advances, sizable bonuses, salaries of people who can't think of enough ways to extort money from us and threaten us with more regulation. Despite all we are made to pay in taxes, we still need to pay for education (if we want quality education for our children), We have to pay dearly for our own (and our aging parent's) healthcare as PhilHealth will only cover a minor portion of it. The SSS and PAGIBIG contributions, deducted monthly from pay and held in trust by the government, will earn you a measly flat rate of 4% per year for the entire paying period until maturity, while the executives of these agencies grant themselves big fat bonuses every year. We on the other hand, have to struggle daily with, traffic, floods, obsolete infrastructure and scarce substandard public transportation. We as a nation, pay more for food, electricity, fuel, cars, housing and internet than our Asian counterparts. With all the Senate investigations conducted, and all the evidences presented, still no one has been held accountable. An ex-President was tried and convicted for plunder but he managed to evade his prison term through a pardon issued by another ex-President who is now herself facing plunder charges. To add insult to injury, the pardoned plunderer is now back in office as a city mayor. And his son, who was acquitted also for plunder, is now under trial for plunder all over again along with 2 other Senators. The Vice President, who is already campaigning for President, along with, his son, the mayor and his wife the ex-mayor are all facing plunder charges. This is the very same government, that is claiming it has public interest at heart, in seeking to impose more regulations and steeper penalties. Really? If this is all the government can give back in services for our taxes, then maybe we should seriously consider NOT paying our taxes. No doubt. we can put all that money to far better use that will actually serve greater public interest. *Apologies for the horizontal scanning of the JAO 2014-01 document. It was that way when I downloaded it from the government site. One of those strange government practices, perhaps. **Annual Income tax will vary depending on the number of dependents. The example assumes the taxpayer has no children.